What are the basic elements of a project management information system? In sub-section Knowledge Management, we describe the fundamentals of a knowledge management system that supports project management processes. There, the main concept is enabling a learning organization by enabling the learning of its members. That learning, we can support by IT-based securing of some of the knowledge our team members gain through their work. This knowledge comprises experience what works and experience what does not work, what we should not do again. In order to secure this kind of knowledge we need an IT-based knowledge management system that preferably includes full text search functionality. (1) Data base of risks: for each risk, it contains estimates of probabilities, preventive / corrective actions implemented, actual data of occurrence and effectiveness of actions. 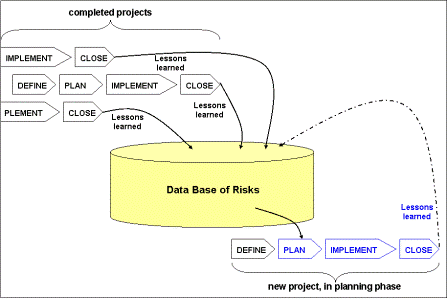 Data about risks of different, already completed projects are systematically collected and stored in a data base. New projects, in their planning phase, can benefit from those data. This approach only works for projects in which we find similar risks. Even then, it is essential to have a high level of motivation and commitment of all project team members to contribute to such an IT-supported system. Please, refer also to sub-section Risk Analysis. (2) Data base of work packages: for each work package, it contains its description and specification, the results of effort estimates, corresponding changes or claims, actual effort. Similar to the data base of risks, we feed the data base of work packages with actual data of already completed projects. Again, a high level of motivation, commitment, and contribution of all project team members to such an IT-supported system are essential. (3) Data base of changes and claims: as a third application, we propose a data base that contains all major changes (change requests and change orders) and / or claims that do not directly correspond to individual work packages, but are significant for the project result. Relevant content for each change or claim could be: underlying event, problem, or deviation; records; analysis results; proposed solutions; actual solution; settlement (in case of a claim). See also the sub-sections on Contract Management and Project Records. High level management support: This seems to be a must. Based on what our participants told us, it is the absolute number one of all success criteria. We emphasize that the support shall be visible and regular, not only a one-time statement. For example, the organization could assign this supporting role to one board member who regularly joins review meetings of the team that manages the project management information system. Compatibility with the organization's IT security policies: In times of information theft, we consider this the other number-one must. Any project management information system must fit into the organization's IT security policy. Quality control: The management team of the information system shall set and apply strict quality criteria, regularly reviewed by experienced project managers, of what should go into it and what does not fit. In case of a full-text search system, counting the number of downloads by different users per entry could be a good indicator of relevance. Other numerical criteria for the search functionality could be the volume of each entry (in terms of the corresponding project, work package, risk value, change or claim, etc.). Regular and frequent update: Information stored must be up to date. Regular and frequent clean-up and update of the content will increase the attractiveness of the whole system. Easy to use: The whole system shall be easy to use, in terms of downloading and submitting information. Easy access, from anywhere: Access to the system shall be as easy as possible, preferably via internet access, as long as it is in-line with the organization's IT security policy. This is vital when ever we have to work in virtual project teams. Simple rules: The rules of system usage shall be simple. There should not be too many rules, to begin with. When is a rule simple? Why not propose a set of rules and ask users for feedback how they understand them? From their answers, we find out how they read them and can conclude what matches with our intentions and what we have to change, further simplify, or explain more detailed. Newsletter: A lively information system needs "public relations", organization-internal marketing; we need to sell that system to potential users. A regular newsletter that is carefully balanced in terms of frequency and volume could be a powerful tool of that marketing. We could send samples to typical potential users in order to find out what is "carefully balanced". Last, but not least, Reward for every contribution: Rewards or incentives for contributions to our project management information system are another way to improve or keep its attractiveness. We leave it to your creativity to invent incentives beyond payment of certain amounts of money. Real people are motivated by many things; for most of us, money is most likely not amongst the first ten motivators on our lists.